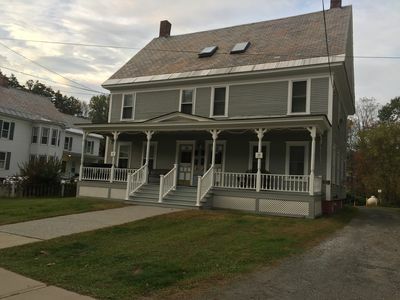 This Victorian home is located one block off Main Street in Ludlow one mile from Okemo Mountain. There is a free shuttle bus from the front door to Okemo with scheduled stops every 15-20 minutes! [Weekends and Holidays]. WiFi throughout house. You can walk to shops and restaurants. There is a small sledding hill and yard for small kids, 30' Blue Spruce Tree, off street parking for 10-12 cars. 10:00 AM checkout! 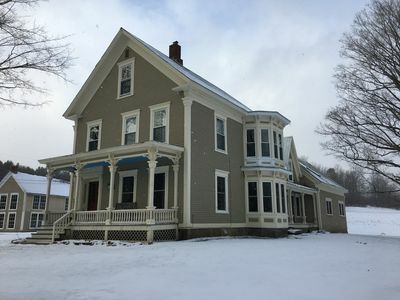 This recently renovated, comfortable, clean and nicely decorated large Victorian home with over 4400 sq ft is perfect for winter ski weekends! 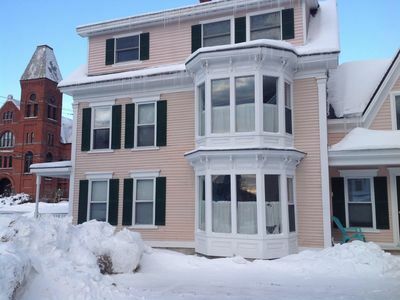 The first floor of the main house has a bedroom with a Queen bed; a bedroom with Double ; a large living room with 2 sofas, 2 chairs, 42' Flat Screen Cable HDTV/DVD/VCR and bay window overlooking the Town Square. It opens to large modern goumet kitchen (new granite countertops & Stainless Steel Appliances ) with cooking island with breakfast counter with six barstools. It is open to the dining room with Two table with twelve chairs . There is a full bathroom on this floor. 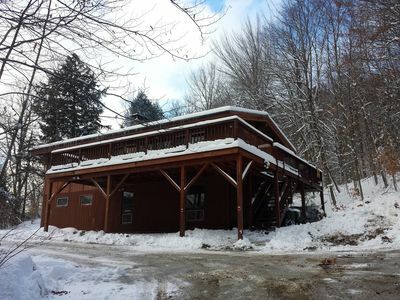 A hallway with washer/dryer leads to garage with ample ski and equipment storage. Stairs lead to the second section with full bath with shower/ tub, bedroom with King and one with Queen and Single plus TV . The third floor has a Double and six Single beds. The front covered porch with great Mountain Views....stairs up to second floor with dining room with seating for ten; living room with 2 sofas, 2 chairs, 37' Cable HDTV/DVD/VCR, bay window; kitchen with cooking island with breakfast bar seats 4, bedroom with Queen and Single , bedroom with King and a full bathroom. The third floor has a washer/dryer, full bath, bedroom with King and another with Double and Single beds. Bathrooms all have tiled floors and ample towels. Kitchens have granite countertops with oak cabinets and are equipped with blender, mixer, large pots, toaster, coffee maker, and plates and silver for fifteen in each kitchen. There are a total of 18 beds with sleeping for 25, four bathrooms and two kitchens and dining areas. Okemo Mountain offers 104 trails providing all experience levels with some of the most exciting and challenging of them coming on the mogul runs on Double Diamond. If you want to try out more than one mountain, a thirty to forty five minute drive brings you to Killington, Stratton, Bromley and Magic Mountains. The Ludlow area could not be better for cross-country skiing with a nice choice of picturesque trails that give you a good workout and some beautiful sights. 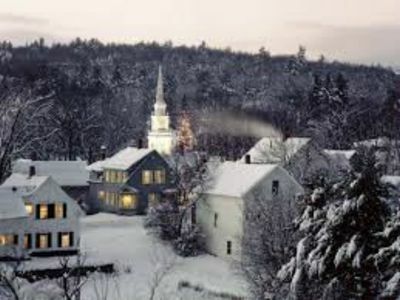 Likewise, you'll find the sledding and snowshoeing exhilarating and enticing. 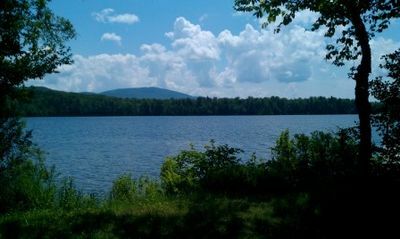 In warmer weather enjoy quiet fishing spots, boating and golf. 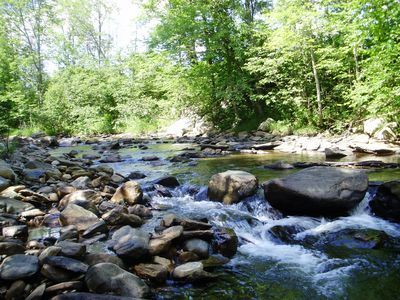 Set time aside to visit scenic Buttermilk Falls before watching a beautiful Vermont sunset. Amenities: Home is 4400 square feet. It is well kept and well supplied with down comforters, fluffy towels and very thoroughly stocked kitchens. Activities: Free Shuttle Bus from front door of Townhouses to Okemo Mtn. Base Lodge and return on Weekends and Holidays. Location one block from Main Street permits an easy walk to Ludlow's great restaurants and numerous shops! Cross Country Skiing and Okemo's new Nordic Center only 2 miles away. Located one block from Ludlow Town Square across from Ludlow Museum. The home has a large yard perfect for small kids to sled or play. 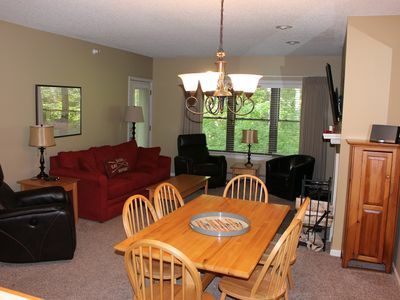 Both living rooms have a Cable Television/DVD (HDTV) and two comfortable sofas and extra chairs. 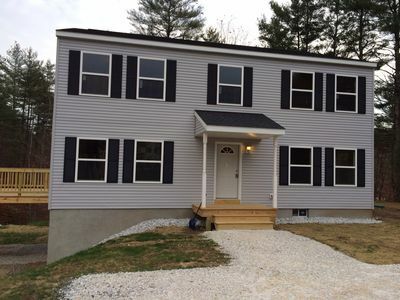 Each has a bay window overlooking the yard 30' Blue Spruce evergreen. The rooms boast refinished original wide pine floors and are nicely decorated. 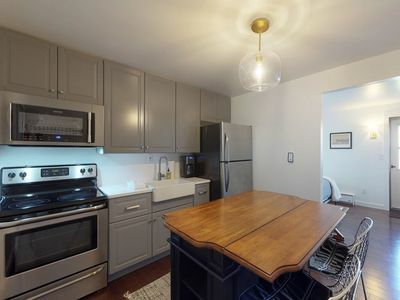 Both kitchens are new, clean and sleek, the lower with oak cabinets and dark green counter tops while the upper has white wood cabinets and teal counter tops. 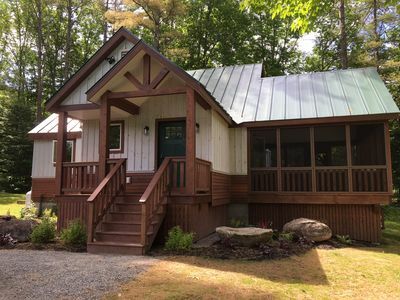 All the requisite amenities are offered in each including microwave and self cleaning range/oven as well as a center island with bar for four to eat comfortably. The kitchens are fully equipped so all you need are the fixings which you'll find in high quality at places like Black River Produce and Singleton's. 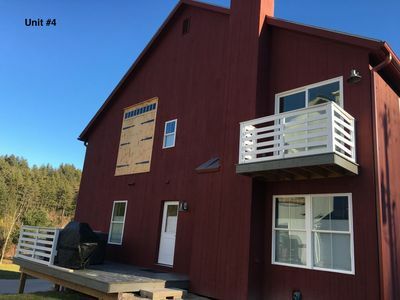 2 Washer/dryers, Gas BBQ, 2 refrigerator w/ice maker, 2 self cleaning ovens, microwaves, coffee makers, blenders, mixers, ample parking, and yard for sledding. All dishes, utensils and linens included. Two Cable TVs on each floor.. 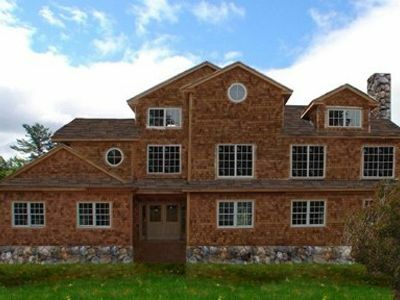 The house is very large with a total of 4,400 square feet of living space. Six master bedrooms all have king (3) or queen beds (3) and large closets. Perfect for couples as all bedrooms have a double bed or larger! Checkout 10:00 AM! Activities: Free Shuttle Bus from front door of Townhouses to Okemo Mtn. Base Lodge and return on Weekends and Holidays. Location one block from Main Street permits an easy walk to Ludlow's great restaurants and numerous shops! Cross Country Skiing and Okemo's new Nordic Center only 2 miles away. Located one block from Ludlow Town Square across from the Ludlow Museum. 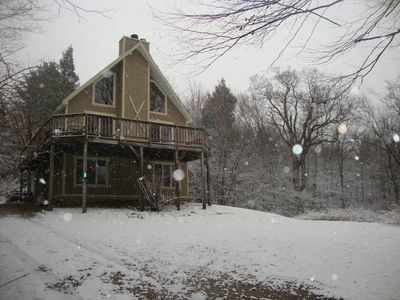 The home has a large yard perfect for small kids to sled or play. 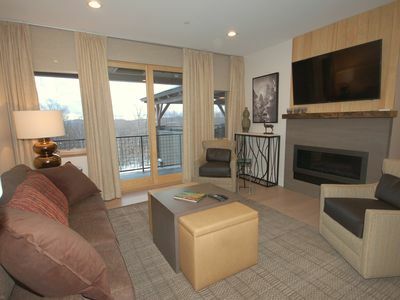 Ski: Okemo's Base Lodge is 2 miles from the house with shuttle from front door holidays and weekends. Golf: The championship Okemo Valley Course that was completely rebuilt in 2002 is ten minutes from the home. 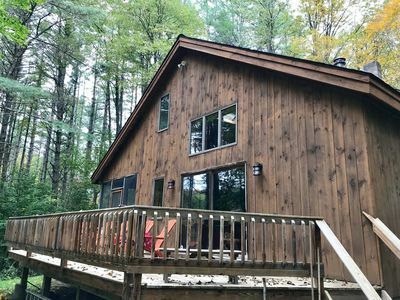 Vermont Barns Townhouse Unit 4 - Ski Okemo! On Snowmobile Trail! 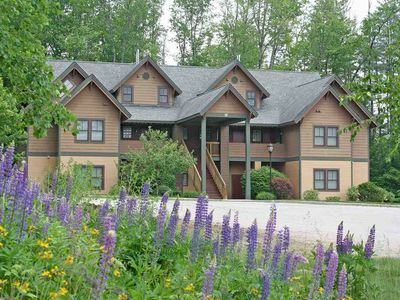 Evergreen is a family friendly retreat located in Weston Vt. 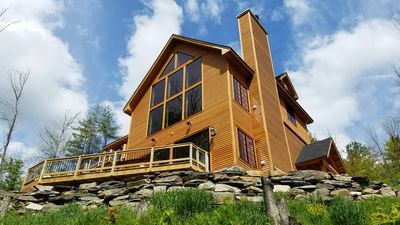 Luxury, New Home on Okemo overlooking mountain stream, WALK to SACHEM Trail !!! 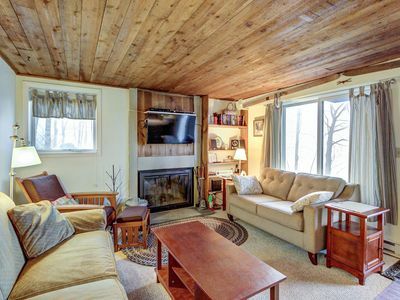 Condo with a shared seasonal pool & tennis courts - walk to ski trails! 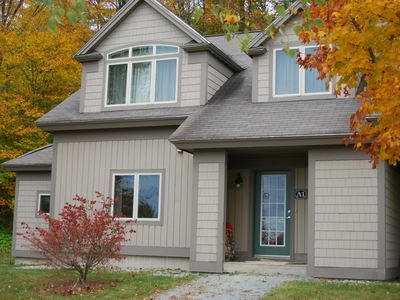 A 3 bedroom, 2.5 bath ski on/off Okemo condo located in Solitude Village. 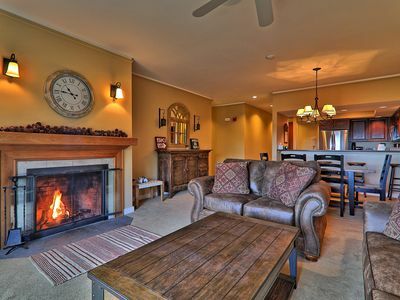 3 Bedroom Castle Hill Resort Condo near Okemo Mtn.